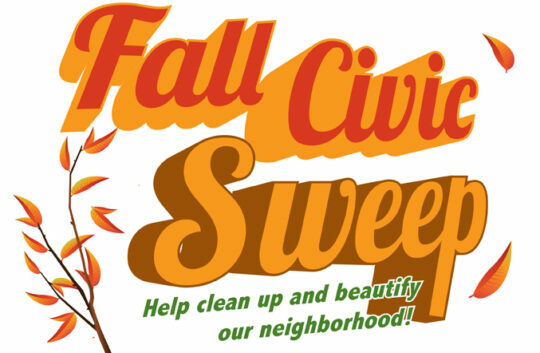 Fall Civic Sweep on Sunday, October 28, free and open to all. Put on your old clothes and come to the sidewalk in front of Old Stone House/J J Byrne Park, 5th Avenue between 3rd and 4th Streets from 10 am to 2 pm (rain or shine) to join other volunteers in sweeping up litter, weeding and mulching tree pits and painting out graffiti on lampposts and mailboxes. The result will be a cleaner and more beautiful community for all who live, work, visit and do business here. We’ll give away free daffodil bulbs for planting in public areas. We’ll serve refreshments, and we’ll provide all tools and supplies. Volunteers will wear T-shirts publicizing the event and leave wearing “I Made Park Slope Cleaner Today” stickers. Community Service vouchers will be available.